When an e-mail Ad’ from pinterest featuring Kirsty Elson’s work appeared on the laptop it immediatly caught my eye. 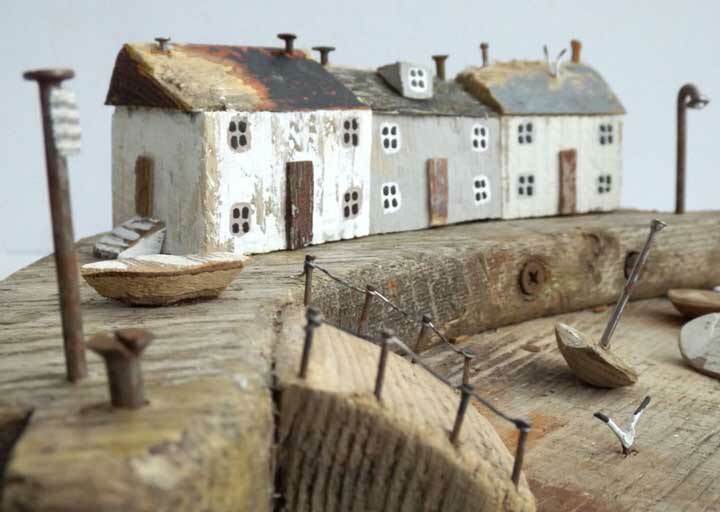 Kirsty’s miniature Cornish harbours created from local driftwood are a joy to behold. The UK’s Cornish coastline is peppered with quaint harbours, dramatic coastline and steeped in the history of smugglers and pirates – an ideal backdrop for any creative mind. 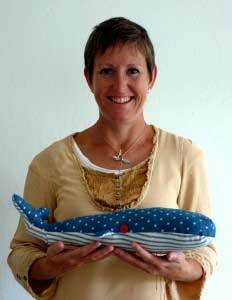 Unlike most artists Kirsty forages on the beaches of Cornwall and in a local market for her craft supplies, most of which are totally free. She lets the materials provide the inspiration and I can think of no better way of being creative – using naturally sourced products that cost nothing found on some of the most spectacular coastal areas in the UK! I was lucky enough to be able to chat with her in this short podcast made via a Skype link in early September 2016. 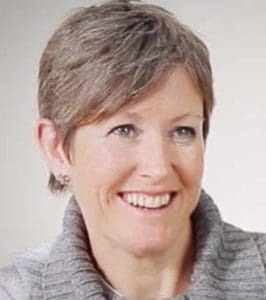 Kirsty discusses her journey from a small child with a love of art, through Cambridge University, family life and eventually to Liskeard in Cornwall where she works from home and of course searching the coastline for inspiration. 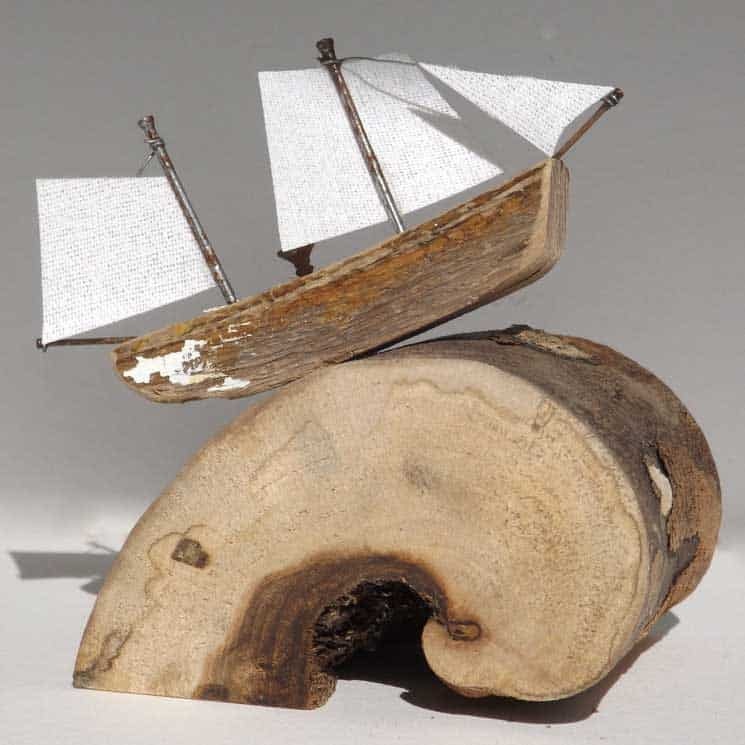 For me she has the dream job of being able to seamlessly integrate family life with artistic work producing stunning art from recycled wood and other quirky objects. 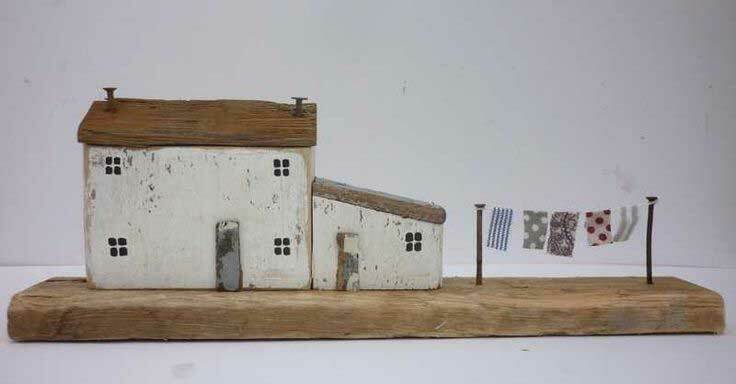 Kirsty produces beautifully crafted art that looks deceptively simplistic. However it takes artistic brilliance to combine each component part of the scene into something so magical. I am sure you will enjoy the interview with an artist who says that she wouldn’t change a thing and is quite happy with the way her career in art has unfolded. 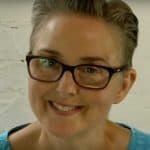 In the second edition of the “CraftsFinder Podcast,” I talk to Kirsty Elson, an artist based in Liskeard, Cornwall in the UK. Her unusual craft art caught my eye in a recent email advert I received from Pinterest. 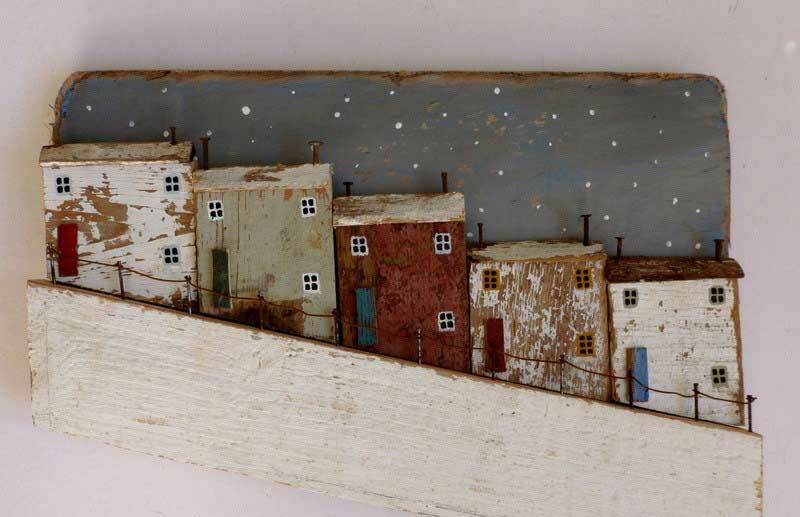 Kirsty recreates classic Cornish Harbor scenes using locally sourced driftwood. 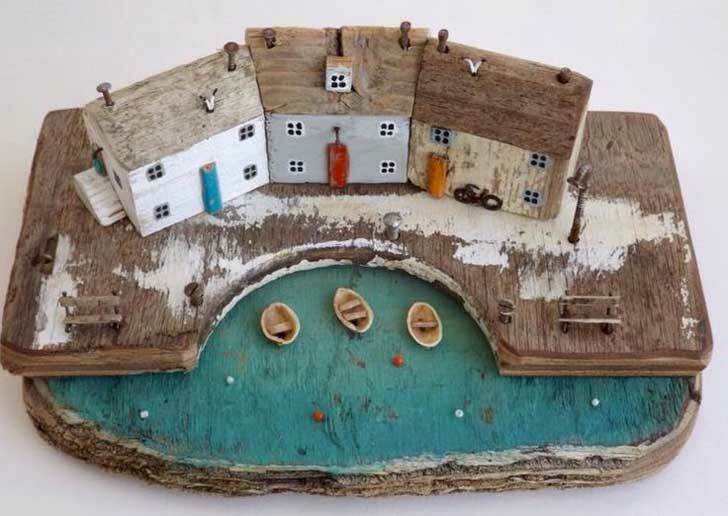 I remember Cornwall vividly from many childhood holidays, and Kirsty Elson’s mini harbor scenes instantly took me back to those magical summer vacations. I caught up with Kirsty via Skype to discuss her fascinating art. Kirsty: I’m not sure that I ever thought I would be an artist. I always loved art. It was my favorite thing at school and it seemed like the right thing to do to take it further. After my A levels, I did Art Foundation and then a Degree in Illustration but, I think, probably, if I’m honest, I never thought that I would end up being an artist. Rob: Are there other artistic influences or artists in your family? Kirsty: My grandma was a painter. Not a professional one but she loved to paint. My dad’s a musician and my sister is a jeweler, a jewelry designer. So, I guess it runs in the family somehow. Rob: You mentioned that you did a degree in Illustration. Where did you study art and what strands of art were you studying at that time? Kirsty: So, I went to Anglia Polytechnic and did Illustration. An Illustration Degree. The course was for three years and I loved it. It covered all aspects really, from graphics to screen printing, history of art, lots of different disciplines. It was a great course, you know, we had lots of guest tutors who would come in and set briefs and it was a great degree. 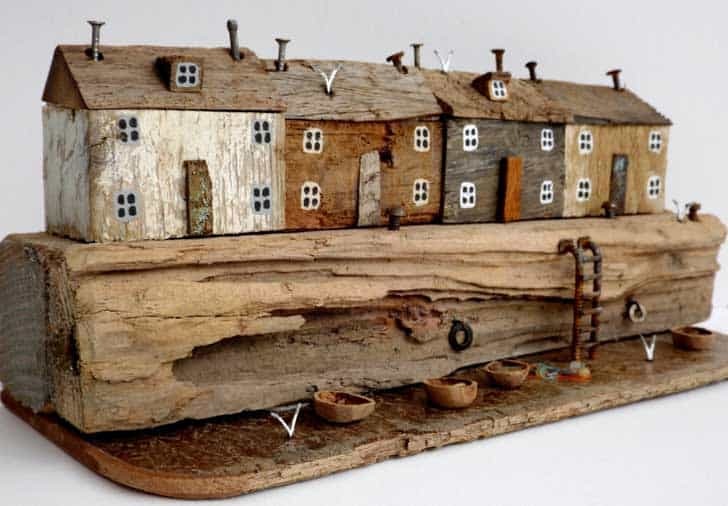 Rob: Your kind of style of artwork uses driftwood and other recycled objects, and you produce some superb harbor scenes which typifies Cornwall’s quirky seaside villages. How did you choose and develop this style of art? Kirsty: I’ve always collected stuff. I get that from my gran. She always used to collect bits wherever she went and I pick up bits from the beach all the time, and I made a birthday card from my brother-in-law and it was just a very simple boat and the birds. 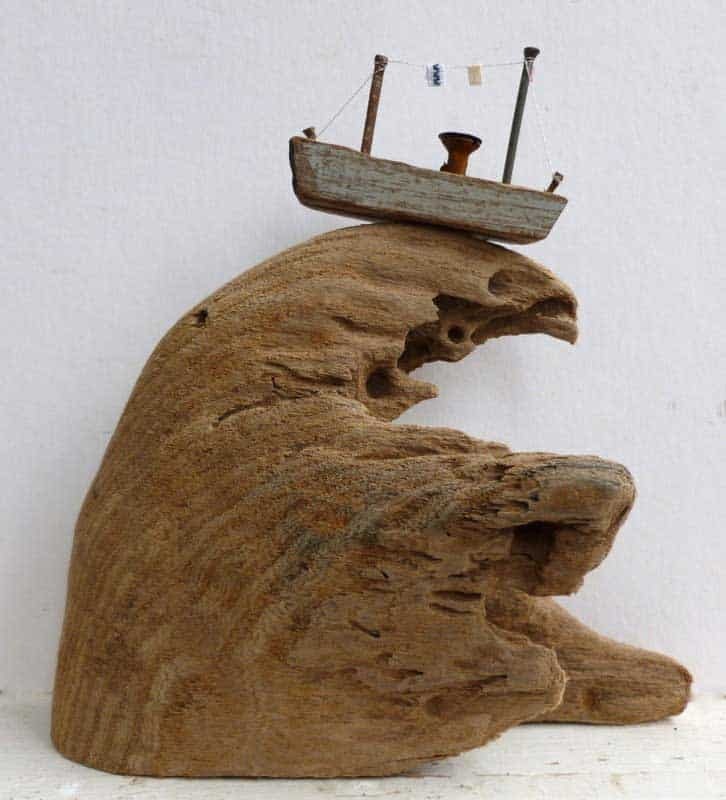 In the hull of the boat was a little piece of driftwood. Very simple. I just put a, you know, a little stick for the mast and a flag and that’s how it all started really. 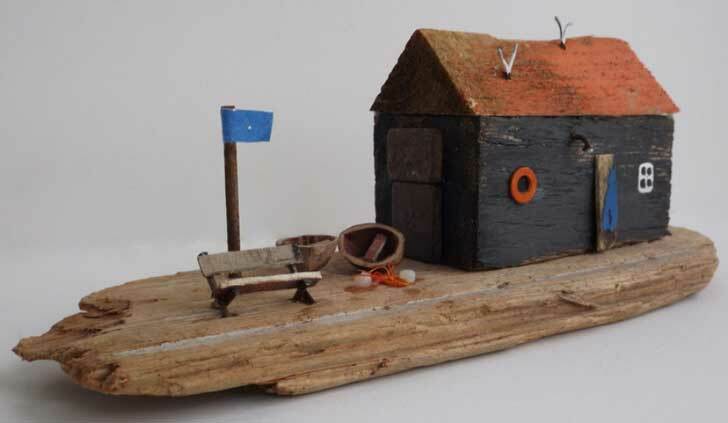 I started making cards, mostly boats, then beach huts and over time, they got bigger and more three dimensional. It just kinda progressed from there, really. Rob: Do you plan out what you’re going to do in a new project or is it something that develops, such as, from seeing something laying on the beach? Well, I think what I’m trying to say is, do the ideas come from the objects or do you have a project in mind and then search for suitable objects? Kirsty: It has to work the first way, really, because you’ll never find the bits that you were looking for otherwise, and I think it keeps it fresh when you’re working from what you’ve found, you know. It takes you in all sorts of directions. I’m completely led by the materials I find. They kind of dictate to me what I’m gonna make. People give me stuff and that’s really exciting, too, because it’s often pieces that I wouldn’t normally pick up. It forces you to think outside the box and, you know, create something different. They often turn out to be the best ones. Rob: You’re right. That’s often the case, especially, I suppose, in the way that you source your raw materials. A bit different than going to an art supply shop. 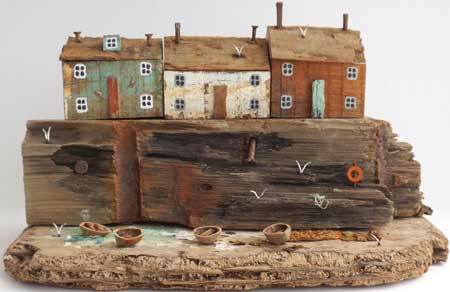 It must be great fun collecting driftwood and other materials. Best of all, it’s free. 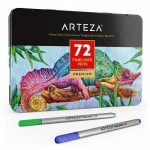 Art can be a very expensive hobby and occupation these days and it must be wonderful to be able to pick up materials for nothing. 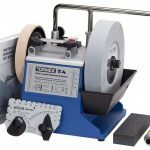 Just wondering, could you describe a typical expedition for new materials and where do you source them from? Kirsty: There’s a great little hut in Liskeard’s Cattle Market run this old boy. It’s like an Aladin’s cave in there. Well, there’s three different sections and they’re all crammed with old tools and bits and pieces and drawers full of random stuff, and I don’t know what half of it is but I’ll pick up something. Like, I made a goat and the ears or horns were a spokeshave, and I saw these things and I thought, “Oh, that,” you know, and I was sort of thinking about it in my head and he gave us a good…he sort of tells me what it’s for and he’ll put bits by for me and it’s, you know, I’d say, “How much you want for all this lot?” and it’s, “A fiver.” Yeah. It’s open twice a week but I love it in there. Rob: So that’s where you find the odds and ends that go with the main work, but do you beach comb locally? I know Liskeard is inland. You’re in an ideal place really because you’ve got North Cornwall, a great coastline there and on the South. So you’re not that far away from a lot of beaches, I suppose. Kirsty: Our nearest beach is about eight miles away, but that tends to be quite busy and you don’t get a lot of wood washed up there. So we head for one that’s a bit harder to access. It’s a great climb down and an even bigger one back up, but I think because of the tides and the fact that not so many people go down there, there is more to be found. And sometimes you have to walk for ages and you think, you know, you’re just about to give up and you think, “I’ll just look around this rock, bit ’round this corner” and there’ll be a whole heap of it. It kind of all tends to wash in together. Rob: Do you ever find things that you would never expect to find on a beach and that you could end up using? Kirsty: We found an orchard ladder. You know the ones with the…it’s wider at the bottom than it is at the top? That was when we lived in Kent and, yeah, it just washed up on the beach. So we had that. Rob: Have you had an opportunity to show and sell your artwork in professional galleries and how do you manage to produce enough for the supply and demand? Kirsty: I don’t show it in many galleries because there’s not enough hours in the day, you know. I’m quite busy with my own website and Facebook and everything. I’ll sell through galleries whenever I can, but it’s not a constant supply because I just can’t make the work quick enough. Most of the galleries I sort of sell through might only be once or twice a year and I send them a batch and of course, once it’s gone, it’s gone. But it’s, I think it’s important to have my work seen in galleries. It’s different to, you know, having it online. Some people like to see it for real and touch it and there’s a certain kudos of having your work in…seen in galleries as well. Rob: Do you take on commissions and if so, do you like creating artwork that someone else has requested? The reason I’m asking is because I find that sometimes lose creativity when I’m asked to do cartoon pottery figures and cartoons. I just wondered if you would experience this drain of creative spirit that I get with being commissioned? Kirsty: I used to do commissions. I stopped, actually, a few years ago. I was getting more requests than I could actually physically make and it kind of zaps your creativity a little bit when you’re constantly making what other people want. I know I’m very lucky in that I kind of just, I make whatever I like and it seems to sell. So, yeah, unfortunately, I don’t do commissions anymore. Rob: You’ve developed a very niche form of artwork over quite a long time span. How do you see your artwork developing in the future? Kirsty: At the moment, I don’t know. I’m quite happy doing what I do. I always like to experiment a little bit, you know, just try and set one day aside a week where I have some fun and do something different. 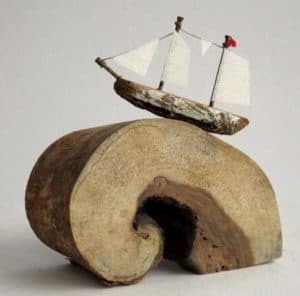 It might happen that I stumble across something new and exciting and go off, you know, on a tangent and stop the driftwood stuff. But who knows? 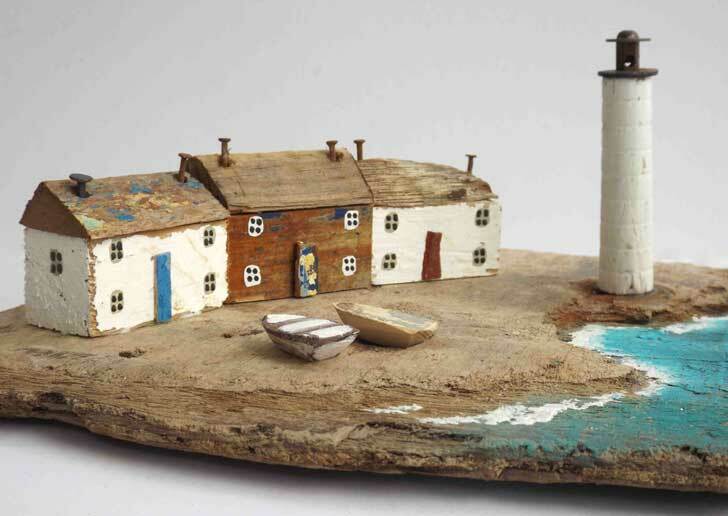 Rob: Do you have your own workshop or studio to create your artwork and is it based at home? Kirsty: I have a workshop. 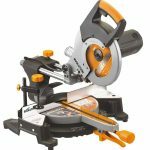 I’ve got…well I’ve got a sort of partitioned off place in the garage with all my tools and that’s where I do all the messy stuff. And then I’ve got…I’ve also got a room in the house where I do the painting and the sort of, you know, more decorative bits. The cleaner stuff. Rob: So, what would be a typical working day for you? Kirsty: I swim first thing in the morning and then I get home from taking my youngest to school and I normally catch up with emails and admin for the first hour. I start work about 10:00 in the morning. I don’t wanna wake the neighbors and then I work right through ’till school picks up. And then I’m sort of on social media most evenings as well. It’s more than a full-time job. Rob: If you had a time machine and could go back to when you were about to study for your art degree, what advice would you give yourself? Kirsty: That’s a hard question. I don’t know that I would change anything. In those days I lacked confidence for sure. I think that’s come with age. I wouldn’t tell myself to work harder because I really did, you know. I made the most of those days. Yeah, I had a good social life as well but I did study hard, too. I’m glad that things worked out the way they did, you know. But I took 10 years out and even though I had some pretty rubbish jobs, if I hadn’t have done those things and if I hadn’t been turned down for a job as a postman, then I wouldn’t have started doing what I’m doing now and, you know, everything’s sort of worked out great for me. So I’m happy. I don’t have any regrets. Rob: That must be wonderful to be able to say that. No regrets. Most artists I know would like to go back and change a few things. Well, Kirsty, it’s been great chatting with you. Where can the listeners see more of your super artwork and find your contact details? Kirsty: So, I have a website: kirstyelson.co.uk, where I sell cards and things that are sort of generally in stock all the time, but I only sell my originals. 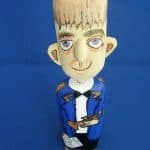 I try and sell once a month through my Etsy store. I kind of, you know, save them up over a few weeks and then have a…do it all at once. And then you can find me on Facebook, Kirsty Elson Designs and Instagram and Twitter under Kirsty Elson. Social media takes up far too much of my time! Rob: You can find Kirsty Elson’s contact details on the craftsfinder.com Podcast #2 page (see above), with links to her website and Facebook page. I hope you’ve enjoyed this podcast. 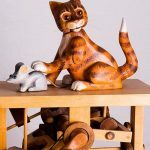 If you’re a craft artist and have a story to tell, please contact me via the About Us contact page on the craftsfinder.com website. 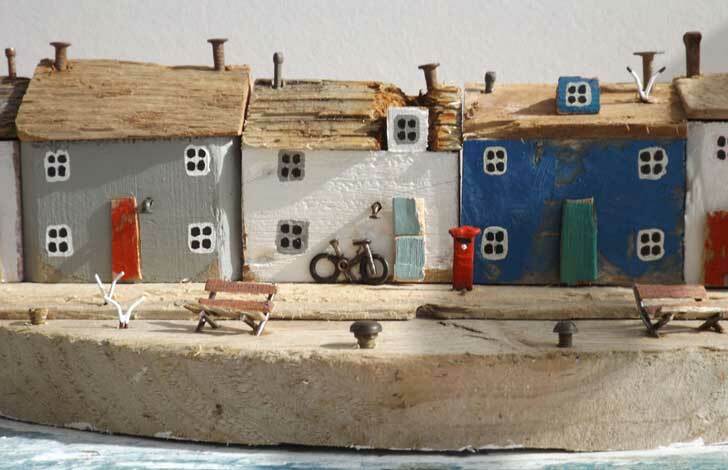 Could you please send me some information on the Cornish cottages you make from driftwood ? If you could get back to me I’d appreciate it.